The Wire Manager is a handy time-saver that helps organize your task when working with multiple wire leads. 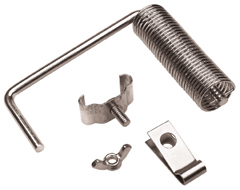 The tempered coil spring is also a convenient place to keep small tools close at hand. Pivots away from the jaws when not in use. Slides onto the end of a 366 Wide Opening Head or 376 Extra Wide Opening Head.